eID passwords: Is it time to change yours? Are you receiving reminders about changing your eID password? eID passwords: Has it been 180 days already? As you prepare for the students to return to campus to start the new semester, you might think that it is time for the campuswide password change period. However, K-State has transitioned from set password-change periods to individual password expirations. 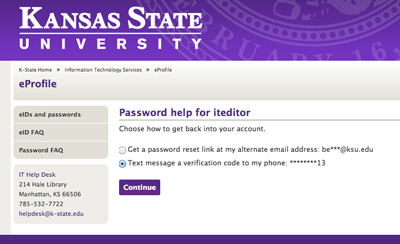 Today (Wednesday, Feb. 13) is the spring-semester deadline for changing passwords on all K-State eIDs. This mandatory password change applies to both individual eIDs and group eIDs. Long-term use of the same password is a known security risk, which is why K-State requires all K-State eID passwords to be changed every spring and fall semester. For the Spring 2013 semester, Jan. 1-Feb. 13 is the timeframe for changing K-State eID passwords. This mandatory password change applies to both individual eIDs and group eIDs. To change your password: Use the connect.k-state.edu webpage to sign in with your eID and current password. Click “Change your eID password” and follow the steps. Forgot your password? Call the IT Help Desk at 785-532-7722 (800-865-6143 toll-free) and verify your identity. Staff can set a temporary password for you to sign in. Text-message verification is now an option to request a password reset. Since the start of the fall 2012 semester, K-State has seen a significant increase in the number of phishing scam emails that are trying to steal eID passwords. Thus far, at least 75 K-Staters have been tricked into providing their eID and password to criminals under the guise of needing to upgrade their webmail account or exceeding the mailbox storage limit. An email reminder was sent Thursday, Aug. 30, to K-Staters who haven’t yet changed their eID password for the fall semester. The Sept. 12 deadline is less than two weeks away. There have been several reports of Apple Macs having issues reconnecting to the KSU Wireless and KSU Housing networks after a user changes their eID password. The best way to resolve this issue is to select KSU Guest from the network list and run through the XpressConnect process again. This will reconnect them to either KSU Wireless or KSU Housing depending on their specific needs. For more information and to go through the XpressConnect process, visit the wireless access page at wireless.k-state.edu. For further assistance or questions, contact the IT Help Desk at 785-532-7722.